An increasingly horse- and solar-powered, historic, diversified, family farm on APR land in the center of Amherst. 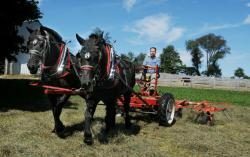 We offer CSA vegetable shares, horse-drawn wagon/sleigh rides, horseback riding lessons and boarding, hay, and farm stays. Hay bales can be purchased and picked up at the farm by appointment. Horse-drawn wagon or sleigh rides for families, parties and wedding. Historic 1850 Farmhouse, one mile from the center of Amherst on a sustainable working family farm. Have a romantic weekend in our master suite, or bring the whole gang and use up to 4 beds in 3 bedrooms, sleeps 6 guests. Horse-drawn wagon and sleighrides through fields and forest at the farm. Summer shares offer a wide variety of fruits and vegetables every week from the first week of June until mid-November. Salad greens and braising greens like lettuce, kale, chard, mesclun greens are available most weeks, along with roots like carrots, potatoes, and onions. Fruits like strawberries and raspberries are available in season, the same as tomatoes, peppers, cucumbers and squash. Each share is meant for a family (2 adults + a couple of kids) or couples who cook and eat a lot of fresh food. Winter shares occur every other week on Saturday mornings from 9am-12pm (arrangements can be made if you can’t come during the regular hours). The winter share includes 12-15lbs of root vegetables typically made up of 2lb potatoes, 2lb onions, 2lb sweet potatoes, 2lb beets (or winter squash), and 2lb carrots in every pick up. Shares also include a bag of spinach most weeks (depending on production) and 2-4lbs of other winter storage crops like parsnips, rutabaga. cabbage, celeriac, kohlrabi, and others which will vary with each pick up. You also have the option to personalize your share by swapping out veggies you don’t want for something you do want if you come during the regular pick up hours.